Great. I know everything in the book about getting the memory confused. Glad I'am not the only one . Next challenge - as I like the tiled clones as well; make - and position - the rectangles in your example using tiled clones. Because the circles are not accurate, just use the polygon, with the curves made rounded -cad uses the same method. On the image posted 48points were used per "circles". The approximations are in the red-green-blue order, blue is the finest. The vanishing point is aligned in the center of the image. 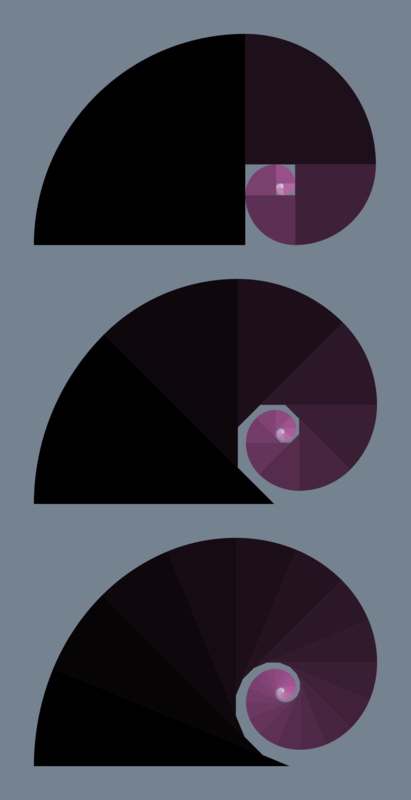 Note, that manually you cannot draw an accurate spiral, just approximations. Personally I'm fine without the cad-like features, could get used to manual drawing quickly. AND something, that is better handled in inkscape than in autocad is small errors. You get inconsistency and boolean effect errors very often, while inkscape just simply merges points close to eachother. Will post my five cents for golden-proportions-rectangle drawing on the tutorial section later on, it's pretty simple. Why, or how, are circles not accurate? Around the path the distance from the origo differs. Only controlpoints are calculated precisely. Zoom in and you will see it. If the circle isn't perfect, how can the angles and arcs and wedges (segments), which are made from circles, be correct? I follow your logic but the circle are made as a bezier curve, a bezier curve with four nodes can never represent a true circle. For (most) all practical purposes in Inkscape the approximation is good enough? Yes, it was made with the * tool. You can be sure about the accuracy if the object can fit when you duplicate and rotate it. Poligon and star nodes are counted precisely that way. Aw, you're breaking my happy, precise Inkscape bubble! This step doesn't work for me. The midpoint of the rectangle's side doesn't snap to the line. I have version 0.48 and all the snap button in the toolbar are selected except for snap to grid. Any idea why? Have no idea why snapping doesn't work. then rotate each with 90° and scale proportionally until they are crossing. It'd be great to finally have a way to invert the coordinates system. Also proper command line options. Also Being able to manipulate centers of rotation like objects. paul59539 wrote: Also Being able to manipulate centers of rotation like objects. For reference, you can do this already.